For a couple of years, I've thought it would be fun to try making dandelion jelly. I'd never eaten it, And wouldn't it make a really unique, fun gift? But somehow I thought I'd need bucketfuls of dandelion flowers in order to make the stuff, so I always put it off. Recently I realized how wrong I was. And the end result is really gorgeous jelly that tastes very similar to honey. When it comes to collecting the dandelion flowers, pick only where you know the plants haven't been exposed to chemicals (including weed killers). Most parks use chemicals to control weeds, and dandelions growing along the roadside "soak up" nearby pollution, so I suggest looking in wild fields or your own yard. My children and I picked enough dandelion flowers from our front yard to fill a medium sized mixing bowl. It took us less than 5 minutes. Then I dumped the flowers into a colander and washed away any bugs and dirt. I let them drain a bit, then I removed the yellow petals from the green part of the flower. It took me perhaps a 50 minutes to pinch those petals away. Another time, I'll get the kids to help me and it will go much faster. Although this is a canning recipe, you may also make the jam and refrigerate it right away, without canning it. It will last several weeks. 1. Review the guidelines for using a boiling water bath canner. Fill the canner and place clean jars inside it. Keep the jars in the canner and the water in the canner hot. 2. 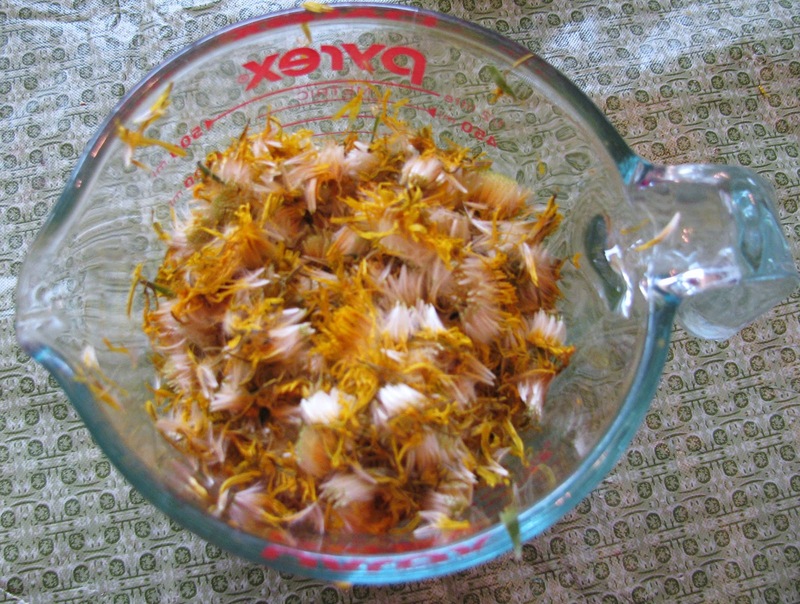 Dump the dandelion petals in a stainless steel pot. Add 8 cups of water. Boil for 10 minutes. 3. Place a bowl on the counter or in the sink and set a fine strainer over it. Carefully pour the dandelion petal mixture through the strainer. Press down on the petals with the back of a spoon in order to extract as much of the golden liquid as possible. Discard the petals. (Don't put them down a garbage disposal because they form a tight clump that might clog it). Thoroughly clean the strainer, removing any petals that stick to it. 4. Place another bowl on the counter or in the sink. Place the strainer over it. Place a coffee filter inside the strainer. (If the strainer is large, use multiple coffee filters, to cover the whole surface of the strainer.) 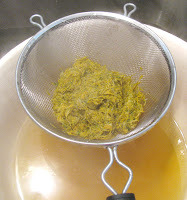 Carefully pour the strained dandelion liquid through the strainer again. 5. Clean the pot so there are no petals or debris in it. 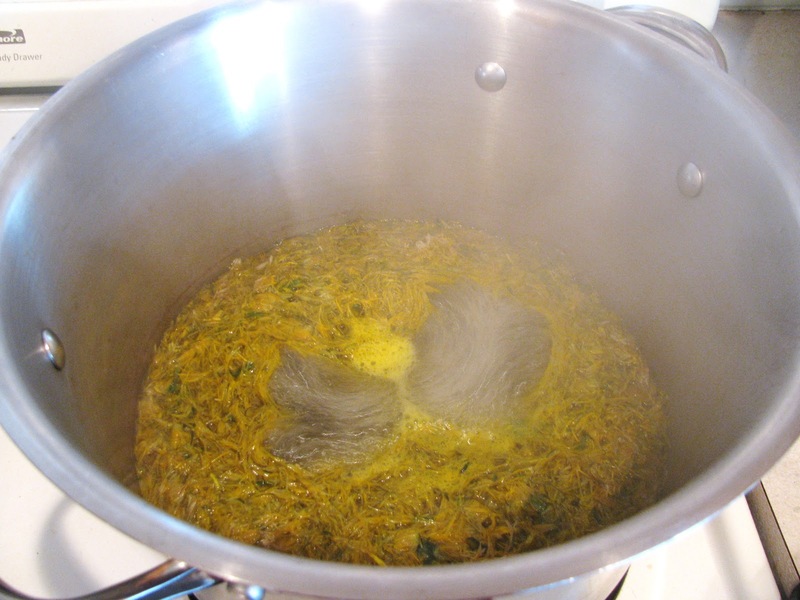 With a clean measuring cup, measure out 3 cups of the dandelion liquid and place it in the pot. Add the lemon juice, vanilla extract, and pectin. Bring to a full rolling boil that can't be stirred down with a spoon. Add the sugar and stir to dissolve. 6. Bring the mixture to a full boil and, stirring constantly, boil hard for 1 minute. Remove the pot from the stove. 7. Ladle the jelly into hot jelly jars, leaving about 1/4 inch headspace. Wipe the rims of the jars with a damp, clean towel. Place the lids on the jars and make the screwbands fingertip tight. 8. 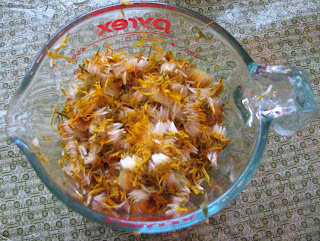 If desired, measure out another 3 cups of dandelion petal liquid and repeat steps 6 through 8. 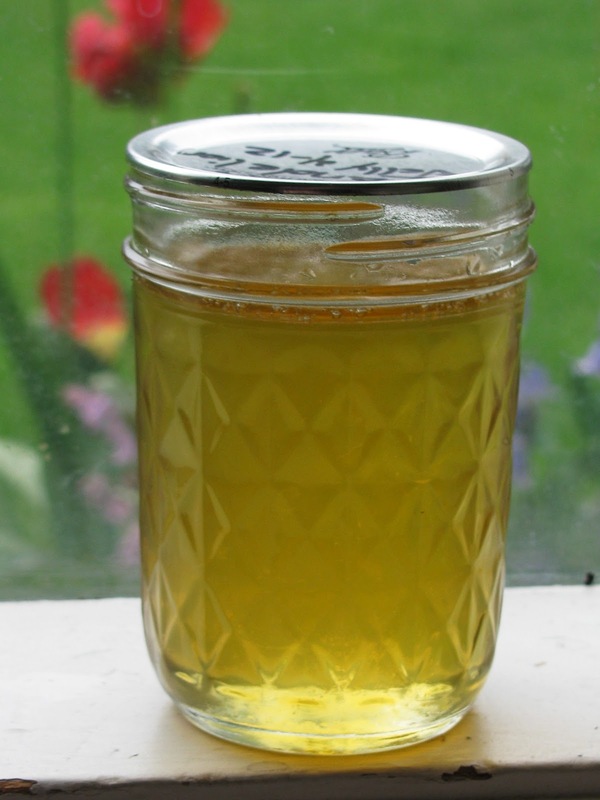 (If you try to double the recipe and use all the dandelion liquid at once, the jelly may be too runny.) Process jars for 10 minutes* in a boiling bath canner. Every 3 cups of petal liquid makes about 4 pints of jelly. * If you live at a high altitude, read this important information about adjusting canning times. NOTES: Any remaining dandelion petal liquid can be refrigerated for use in teas. Or, pour into ice cube trays and freeze for iced tea. 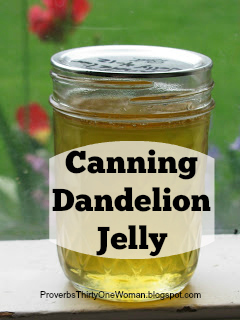 Some dandelion jelly recipes call for pouring the jelly into sterile jars and sealing without processing in a hot water bath canner. However, this increases the risk of food poisoning and is no longer a recommended practice. Cautions: According to the University of Maryland Medical Center, very rarely, people have reactions to dandelion. If you're allergic to "ragweed, chrysanthemums, marigold, chamomile, yarrow, daisies, or iodine, you should avoid dandelion. In some people, dandelion can cause increased stomach acid and heartburn. It may also irritate the skin. 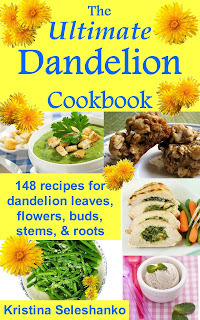 People with kidney problems, gallbladder problems, or gallstones should consult their doctors before eating dandelion." 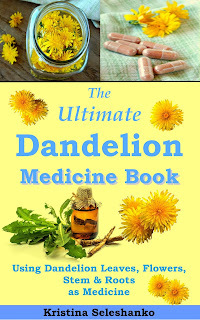 Dandelion is a diuretic, which means it may also make other medications less effective. To learn more about this, visit the University of Maryland Medical Center website. Darling--what I've learned from you is it's a TON of work to process these dandelions--but the reward is literally SWEET! :) Please start SELLING this jelly--I love it! I expect you to start an apiaray next so I can buy honey as well! NCBeachMom, I think you're teasing :) Actually, I didn't find it that much work. Certainly about like any jelly recipe. The most time consuming part was harvesting the petals, but if you do it as a family, I think it would be really fun. I probably wouldn't do it more than once or twice a year, but then we don't consume much jelly and most of this will end up as gifts. We have a lot of parks, though, and some are many, many acres, and some are remote-ish. I was thinking I'd ask the park rangers if they spray, or if there are areas they DON'T spray that I can access easily with two kids. Question: if I were to get dandelions to boil, but I wasn't ready to can, can I freeze the prepared juice until I have time/supplies to can? I saw in my canning book I could do that if I needed to, but didn't know if that could work with dandelion stuff, too. I don't see why you couldn't freeze the "dandelion juice," so to speak. You'd just need to thaw it - and I would warm it before adding the additional ingredients. 3 cups of the liquid to 4 cups sugar? Is that right? 3 cups liquid to 4 cups sugar? Is that right? I make this every year and sell it at my farmer's market booth, it's a hit! You can freeze the juice to finish processing later into jelly or if you really need to save freezer space freeze the cleaned flower petals and process like fresh when you need more jelly. My wife's favourite way to eat this jelly is a spoonful stirred into plain or vanilla yogurt. 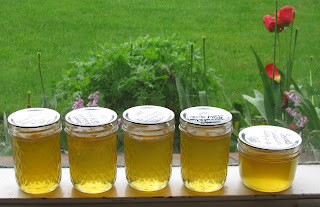 I use no-sugar pectin and make my jelly with 3/4 cup sugar to 1 cup juice.